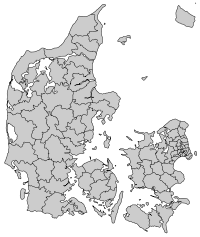 Brøndby Kommune (Danish pronunciation: [ˈb̥ʁɶnb̥y]), a municipality (Danish, kommune) in the former Copenhagen County (now Region Hovedstaden), is on the east coast of the island of Zealand (Sjælland) in eastern Denmark. The municipality covers an area of 20.85 km², and has a total population of 35.322 (2016). Its mayor is Ib Terp, a member of the Social Democrats (Socialdemokraterne) political party. Brøndbyøster is east of the big intersection that parts the three different Brøndbys. (Brøndby Strand Projects '93), this part of the city has many older people and immigrants. Brøndby Strand is a mix of those two cities. There are lot of single-family houses and 12 high-rise residential estates. This area has produced musical artists such as Outlandish, Burhan G and Majid. Its ZIP-code is 2660. It is also the only ZIP-code in Denmark where more than 50 percent of the population are non-danish. Read this article for more information:http://www.dr.dk/nyheder/indland/2660-danmarks-foerste-postnummer-med-etniske-danskere-i-undertal-0 . These four neighborhoods are also known as the Southside or Southcoast Copenhagen. Brøndby is the home of Brøndby IF, a football club. It is also the home of the National Hockey League player Mikkel Boedker.